The poet’s journey is the story of learning to observe and describe one’s experience of the world. Great poets are first great listeners. There are two sides of the language coin: understanding and speech . The two develop in tandem, but understanding, or receptive language, leads the way at each stage. Young babies make cooing sounds — soft vowel sounds unbroken by syllables. As the weeks go by, they begin to experiment with varying the volume of their cooing. Within several months, they practice varying the pitch. This happens even in children who are completely deaf . Sometime in the second half of the first year, babbling begins. This is the sweet sound of consonants and vowels mixed together. 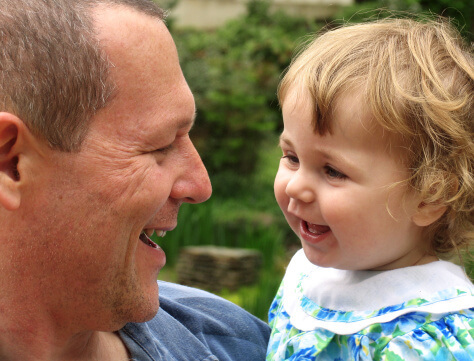 The amount and quality of babbling vary depending on how well babies hear and how much people speak to them. Soon babbling gives way to jargon, when kids begin to imitate the sounds and tones of adult speech. They jabber on and on, and if you didn’t know better, you would swear it must be some real language. Around this time, kids begin to point at objects around them. Pointing is a key step in language development. Kids’ jargon begins to coalesce into a few words, using the same sound for the same object over and over again. This might be “ba” for ball or “dah” for dog. The first words are usually nouns–names of people, animals, or objects that are important to the child. The time period for gaining the first 50 or so words is often very slow. Babies may or may not say their first words before taking their first steps, but the first words are understood long before then. And babies are already working toward saying them. Eventually, within another year, an explosion of language will follow. This is when children rapidly learn to use hundreds of words and begin combining them in unique ways (“spoon comb” for fork, or “me puter TV now” for wanting their turn at the computer monitor–you’ve been surfing long enough). Most kids come out with delightful, original utterances during this stage, making great fodder for baby book memoirs. Two word phrases are the hallmarks of two-year-old poets.